If you ever hear the rumor that I'm not family oriented, heres proof that it's a lie. I've always loved being around my family, they are the sweetest people I know, and since my Grandma had a ton of kids I have loads of cousins, so forgive me if I forget one of the little one's names now and then, just because I have a short term memory dosn't mean I don't love them to death. In the back by the other table is my aunt Karis (she's kinda hiding, then my uncle Jeff, on the bottom Left side of our table is my twin sister Kristin, holding Settie, then Me(well half of me anyways), then Megan, and Emily, then on the edge of the table is some girl that is like an in-home-sitter for my cousins Meg, Rach, and Erin, and speaking of Erin on the top right hand side of the table there she is, going right we have my baby sister Kelly, then my sweet little cousin Martin. 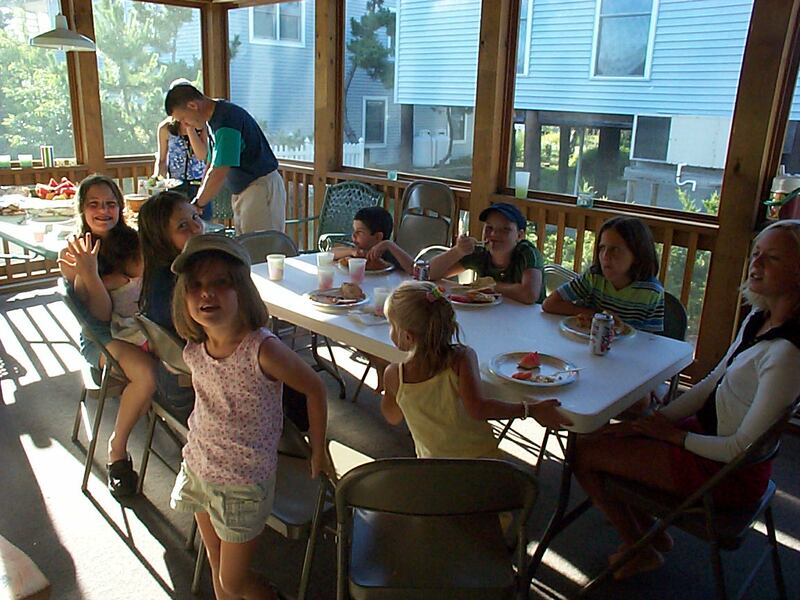 This was a really fun week, cut short for me because of gaurd camp, but both of these pictures are from our summer house in Bethany Beach at our Family Reunion(which was last summer not this one). I love my daddy soooooo much!!!! I was his little ride-along buddy this friday cuz he wasn't feeling good and neither was I, but he said he was glad I was with him"incase anything happened." Daddy has been having panic attacks and stuff lately and I'm sorry I've been ditching my friends, but my daddy is getting on into his later years, I want to keep myself as close to him as I've been my entire life. This dosn't mean for one moment that I don't love Richard or any of my other friends, but you guys have to realize, my daddy is so much older than yours, I'm not sure if my daddy will be around to see me get married even though I hope with all my heart he is, I want him to know that I've grown up to be the daughter he wanted and that I'll always be that to him.